On North Avenue in the Station North Arts district—a midpoint between East and West Baltimore—a wall is affixed with a wheatpaste image of legendary dirt-biker Wheelie Wayne popping his namesake alongside the words, “Pick up a bike, put down a gun.” It’s popular slogan among the 12 O’Clock Boys, a black dirt-bike crew who’ve been local antiheroes since their founding in the early ’90s, and who’ve become a far more visible presence in recent months as the city, just like much of the rest of the country, has suffered through an exceptionally violent summer. 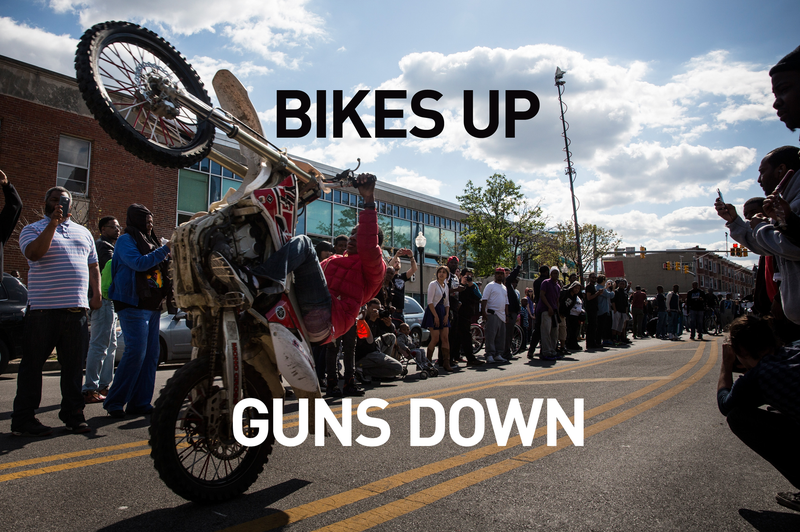 There are hundreds of riders in Baltimore, most of them young black men; they ride dirt bikes and ATVs, both of which are illegal in the city as of 2000. Named for their signature move of popping their front wheels and aiming their bikes skyward to simulate clock hands striking midnight, the 12 O’Clock Boys are among the most infamous of the organized groups, serving as a national face for the local biker community after the release of the 2013 documentary Twelve O’Clock in Baltimore. Largely from poor areas of the city, the riders come up young and help novices out as they get older. As documentary director Lotfy Nathan acknowledged in a 2012 VICE interview, immersing yourself in the city is an integral part of the sport: “It’s a chance for kids who would otherwise be stuck in their own neighborhoods to parade through the whole city and declare it as their own.” And once it’s theirs, they take care of it: In April, following West Baltimore resident Freddie Gray’s death while in police custody and the nationally televised protests that followed, the bikers provided live, impromptu entertainment amid the turmoil, performing tricks for the gathering crowds and curbing the high tension between the police and the protestors. Dirt-bike crews never appear politically affiliated, but they are community-affiliated. But they’ve also long been a public-safety concern in the city—in May, a woman died after a dirt bike struck her and its rider fled; in July, a 21-year-old biker was struck by a car and killed—and an ever-intensifying police crackdown has been in effect all summer. Cops use road blockades to prevent riding, conduct heavy surveillance to serve warrants, and even physically chase dirt-bikers through the streets, which contravenes official law-enforcement policy meant to curb accidents. Two Sundays ago, a police car hit a 16-year-old dirt-biker and left him with a broken ankle; a week later, witnesses say a police car hit a stalled dirt bike while its rider was still on it, and watched as officers tased the rider in the back when he fell down trying to get away. There was no mention of the incident in the press. At Druid Hill Park in Northwest Baltimore, where dirt-bikers have met up every Sunday for months, police, some openly carrying riot gear, have begun to assemble every Sunday as well, citing an alleged early-August fight between onlookers as their reason to watch the area more closely. During their first en-masse appearance, on August 9th, one officer brandished his gun at a crowd that had gathered to watch the bikers. 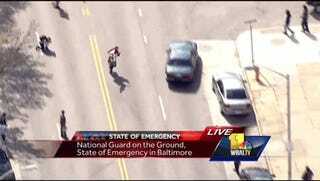 (The officer is now on administrative leave.) A week later, policemen equipped with riot shields and helmets tapped their batons on the ground while a small group of children hung around news cameras on the side of the road. More recently, hundreds of orange traffic cones dot the street, slowing traffic and creating room for the dozens of parked police patrol cars that fill the negative space. It’s a turf war the bikers are losing, and it’s not the first one. In Baltimore, which creates its public policy within a segregationist paradigm, the ability to occupy space is a big deal. Though built into the city’s laws for over a century, the assumption that black people must move elsewhere to accommodate white interests is still frequently baked into tangible policy. Last month, the city closed one of its highest-performing and well-appointed schools; a primarily black elementary school, it was the only building that fell within the “redevelopment zone” surrounding the racetrack where American Pharoah won Preakness this year. That May event made more than $85 million, while a crowd of 131,680 mostly white onlookers drank in and around the Pimlico Race Track. The demographic makeup of the surrounding neighborhood, whose median household income sits under $24,000, is around 90-percent black. Children displaced from that elementary school in Park Heights—the neighborhood dozens of police officers now spend full Sundays discouraging dirt-bikers from entering—are now being sent to an underperforming and overcrowded school nearby. That Baltimore’s segregation is policed by the government might seem insane in 2015, but its roots are some of the oldest in the country. Over a century ago, in 1911, the city’s then-Mayor J. Barry Mahool signed an ordinance that constituted the first municipal-housing segregation law in the United States. At the time, white residents blamed black residents for a tuberculosis epidemic, and began vandalizing the homes of their black neighbors. The unrest persuaded officials to place legal barriers between residents of different races; today, government-funded “urban renewal” projects aimed at recreational areas around the Inner Harbor, previously DIY art spaces in Station North, and the neighborhoods around the Pimlico racetrack serve as their own, subversive way of furthering the racial divide by driving locals out. The bikers, however, have challenged this systemic separation simply by riding through it. They ride from their homes—poor areas of the city often sensationalized by shows like The Wire—through the wealthy, whiter neighborhoods that sit directly next to them. For much of the city’s black population (holding strong at 63 percent), they’re real-life examples of how to survive in a deeply segregated city: They’re powerful because they can go where they please, and because no one can catch them. While everyone, including the bikers themselves, acknowledges that the sport can be dangerous, riders use hand signals and even ride in grassy areas to avoid intermingling with car traffic. As the bikers see it, they’re extreme athletes willing to accept personal risks or even injuries if it offers them a rush. Most started riding as young children and were mentored by those who came before them; now they pop wheelies, stand on their handlebars, and perform other stunts for their families, friends, and potential crushes. The police scanner blows up as they ride, with officers mostly monitoring them from afar and occasionally pulling a bike over to check ownership papers. In mid-August, officers pulled over a truck riding down Reisterstown Road (which sits next to Druid Hill Park) with a few bikes in its bed, and removed each to check their legality before sending the driver back on his way. Another rider, when asked whether bikes were sought out when not being used, claimed that earlier this summer, officers raided a warehouse full of bikes, impounding even those with ownership papers. Over the scanner on Sundays, officers talk about looking in backyards throughout the city to find bikes they might serve warrants on. In places where bikers keep to grassy areas, officers park their cars nearby. Their pursuit is militant. The police department uses helicopters, social-media surveillance, and iPads to monitor dirt bikers. And despite the city’s policy of avoiding outright chases out of ostensible concern for public safety, some officers on the scanner can still be heard claiming to be “right up on” individuals and small groups of riders as they drive all over the city. With each successive Sunday, the police’s frustration is more and more audible; many bikers say cops have chased them or hit their bikes at one time or another. Police officers have, through repeated public statements implying that Baltimore is not or will not be safe so long as dirt-bikers hold sway, created a situation that bodes ill for the city. They have turned a false prophecy of black violence into a concrete policy that requires them to present a preemptive show of force so that the people they’ve frightened with rhetoric will feel safer. It’s “broken windows” policing, a cute term Rudolph Guliani made famous in New York City, and Baltimore Mayor Martin O’Malley implemented himself back in 1999; here, at least, that philosophy still holds up today. And now, as homicide rates are at an all-time high, it has been laughably used against the bikers in an attempt to curb the violent crime they’ll allegedly bring with them, even though there’s no definitive proof that suppressing community events will lower death tolls. If there is any tangible evidence of success to this “broken windows” policing, it’s in the government’s ability to control the optics of space. People in areas that have wealthier and whiter populations are encouraged to feel safer because they see less graffiti when they drive around, or because they see fewer groups of young black men riding by on illegal dirt bikes. The city’s infrastructure seems overwhelmed by its own policies, though. Currently, riders and anyone assisting their activities (including gas-station attendants) may face penalties of up to 90 days in jail, a fine of up to $1,000 or both, if convicted. Riders caught by police may also have their bikes impounded. In East Baltimore, one of the city’s impound lots holds so many confiscated bikes in various states of disrepair that it’s running out of space; those bikes have not yet been sold, donated, destroyed, or otherwise deemed unfit for forfeiture, as the city code states they must be. None of this has stopped the bikers yet, but it certainly has highlighted an unbridled animosity between gentrifiers and the black residents they’re displacing, where previously there’d been an unspoken understanding. During the earliest Freddie Gray-related protests, marchers from predominantly black districts entered areas of relatively low permanent residency (mostly around City Hall, Camden Yards, and the Inner Harbor), and as they did, white passersby would occasionally call out, “Get out of our neighborhood!” to peaceful demonstrators. Before and after these marches, black city residents and police officers would stare each other down over police barricades and riot shields. When dirt-bikers would arrive and perform tricks under these conditions, they seemed to be providing relief from that fear and anxiety, not adding to it. In a city with more than 200 murders under its belt so far in 2015, and a clearance rate sitting at less than 40 percent, the bikers should be among the least of the city’s problems. Some community leaders—and many riders themselves, and even at least one city councilman—have suggested creating a dedicated park for the dirt-bikers as an effort to remove them from the streets, and curtail these philosophical and physical crashes with the police. Residents seem to agree; over 81 percent of respondents to a Baltimore Sun poll view the pastime as a sport and are in support the construction of a dirt-bike park, which in addition to increasing street safety could help riders could become licensed, encourage the use of protective gear, and maybe even turn a profit for the city. So what’s the holdup? Law enforcement is against it. The issue isn’t safety or profit: A police department whose union won’t concede that black lives matter will never protect those lives to the same degree that it protects white interests. If the issue were about the city’s well-being, more than 70 percent of Baltimore police officers would not live outside the city limits, where they avoid having a greater investment in and better understanding of the communities they police. Caitlin Goldblatt is a freelancer writer whose work has appeared City Paper, Jacobin, and Guardian US. She lives in Baltimore and tweets @trustpunch. Follow us on Twitter, too.